If you start with the conviction that the Fed can perfectly control the real economy, then any protracted slump is, ipso facto, a Fed failure. Hence we see blogposts like "This one figure shows why Fed policy failed". The blogpost argues (awesomely I might add) that the graph shows failure in two ways. First because the increase in the Fed balance sheet was "temporary". Now people, let me point out that it is April of 2014. So all the unshaded part of the graph is in the future! 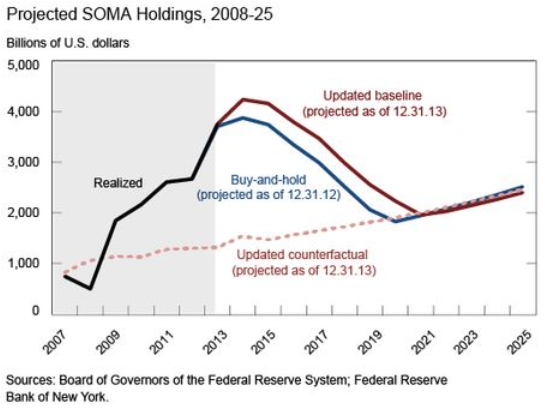 And as you can see, the latest projection of when the Fed's balance sheet returns to its pre-crisis trend is in 2021. And it's quite likely that future projections (if anyone is so nuts as to continue to make them) will push this date further into the future. So the idea that a graph of things that have not happened can show the Fed failed is pretty weak sauce. And, even if it does go down like that, we are still talking 14 years of super-sized balance sheets as too short a time to get people to "rebalance their portfolios"
The second reason the graph shows failure is because the asset purchases were so large! (I am not making this up). 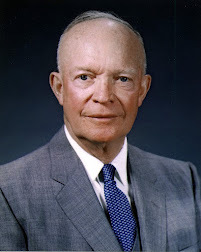 "Had the Fed credibly committed from the start there never would have been the need for all the subsequent LSAPs." But of course we know from econ 101 that the Fed cannot credibly commit! To anything, least of all to letting inflation run above its own desired level in order to top up nominal GDP from its recessionary shortfall. 1. Not all recessions are prima facie evidence of Fed policy failures. 2. Not all Fed predictions / projections actually come to pass. 3. When you hear some one telling you all the Fed needs to do is "credibly commit", RUN! "...the Fed cannot credibly commit! To anything, least of all to letting inflation run above its own desired level in order to top up nominal GDP from its recessionary shortfall." That implies that inflation targets are likewise unattainable. While that's a reasonable view given actual central bank behavior, it's a pretty dismal outlook for macroeconomics. Perhaps there is some underlying political determination of monetary policy which is independent from macroeconomists' recommendations. I think it's more reasonable though to view macroeconomics as at least providing some sort of constraint or at least pushback when there is political pressure to deviate from a policy. In the 80s, inflation levels fell across a wide variety of countries, both developed and not developed. It would be hard to just hand that away as some sort of political shock which hit almost all countries on earth simultaneously. Surely macroeconomic theory played at least somewhat of a role in influencing that trend, and once you allow that macroeconomics can influence a policy variable, any nominal variable could theoretically be targeted (with political deviations). So, what percentage of policy outcomes are political and how much is economic theory? I'd say economic theory puts pretty sizable constraints on political control of monetary policy, probably limiting them to a range of no more than a 15% band.